Fact: before they were mothers of the brides, they were brides themselves. 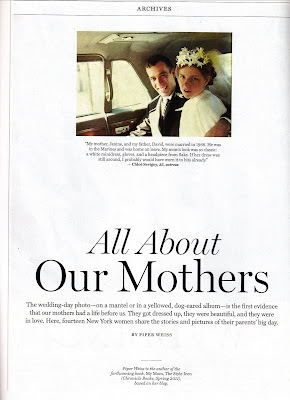 New York Magazine's Weddings Issue just came out and it's got a 6 page spread featuring vintage pictures of moms submitted by locals. Oh, and the story is compiled by this here blogger. Let's have a flip through, shall we? Lookie here: that's uber-style icon Chloe Sevigny's mom in her "just married" limo. Hot stuff. Recognize this lovely lady? 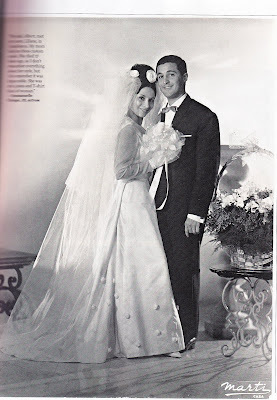 It's Emmanuelle Chriqui's gorgeous Moroccan mother on her big day. 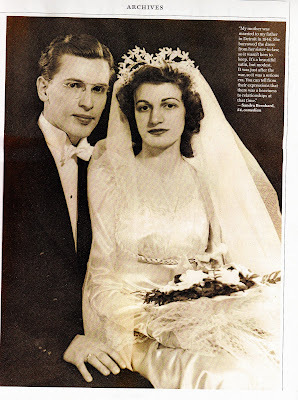 Here you may recognize the very in love Marilyn and Monroe (top left) under the Chuppah. Mom's wearing an angora sweater dress. Deal with it. Top left is Brooke Posch's stunning mama Judy and little girl who's is not Brooke's dad p.s. Bottom left is the lovely Kathy Raupp, mother of Aimee Raupp, surrounded by 5 Pocahantases (or Pochahanti). Bottom left is Kristin Chenoweth's pretty in pink mamma and lucky dad. Tracy Hopkins' mother sported a bright blue bow (pre-Tavi). Fun fact: her dress was only $110. 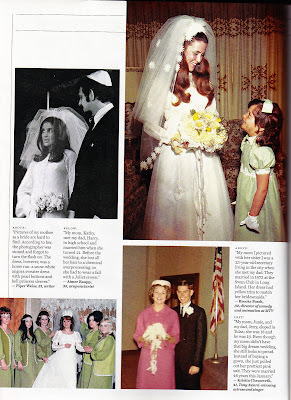 Bottom left, is Jess Rotter's beautiful mother in a turtleneck dress and her father-- the human head. And bottom right is Ryan Green's mom, dad and tree-huggin' hippie friends at their backyard affair. 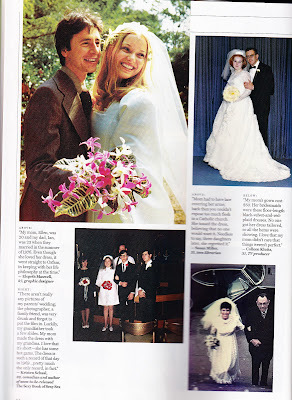 Top left is the beautiful Ellen, Ellsbeth Maxwell's mom. She donated her princess sleeve dress to Oxfam. 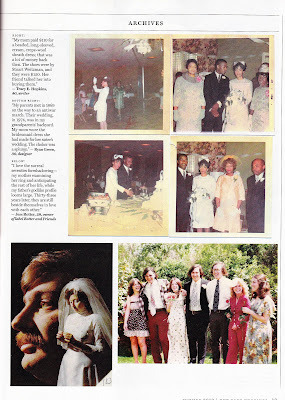 Bottom right is the only photo to survive comedian Kristin Schaal's parent's wedding. The photographer forgot to turn the flash on. Top left, Susan Miller's mom glows in white. And bottom right, along came Polly, Colleen Kluttz's purdy mom. Oh hey, while I'm tooting this here horn I bought for myself, check out this interview Another Magazine did with MMTSI. And, if you're in the NYC area tomorrow night at 7, you should totally come to Opium Magazine's Literary Death Match where funny writers read funny things. I'll be a judge along with Eddie Safferty and Denise Oswald. Tix are $5 online. Get em here. 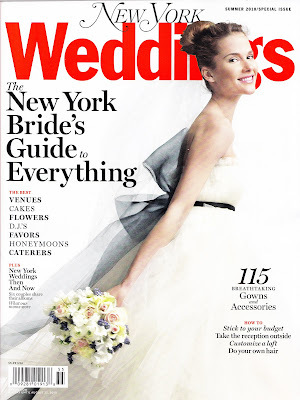 I saw this yesterday in New York Mag. Congrats! !